It started back in July. We figured since we were on this side of Fiji and it was said that June and July were the best months to sail the Yasawa’s then why not? Let’s go. We left our comfortable anchorage at Musket Cove and headed N.
Within the first hour our Tacktick depth sounder chose to take a vacation. The display read <reset data>. What the hell is that about? I pressed some buttons to work my way through the menus and never found one that indicated, <reset data>. While working the buttons and trying everything I knew about electronics with just a few buttons, various combinations, etc. I came to the conclusion that the display has taken more then a vacation but has passed on. I noticed too the battery was low. I left the display in the Sun for a few hours and the battery was still low (it has a solar charger built in). I checked the manual and found I can actually power it up and charge it with 12 v. I tried that and at the end of the day the batteries were still low; not accepting a charge. Ok… time to move on. Fortunately the water has quite good clarity so we didn’t need to abort our trip. Also fortunately, Fiji is one of the places in the Pacific that every island, every harbor, every passage has internet. I begin to research. I first discover that no one has reported the same issue. I contact Raymarine, a company owned by FLIR, and ask them what to do? Surprised, I actually receive an answer. I turn the display on, see the error message, and the display powers off – all by itself. OK, time to move on. I’ve spent enough time messing with a dead display. The unit will not even stay on long enough to do what Raymarine suggested so I move to stage 2 of my plan. I look for an exact replacement. 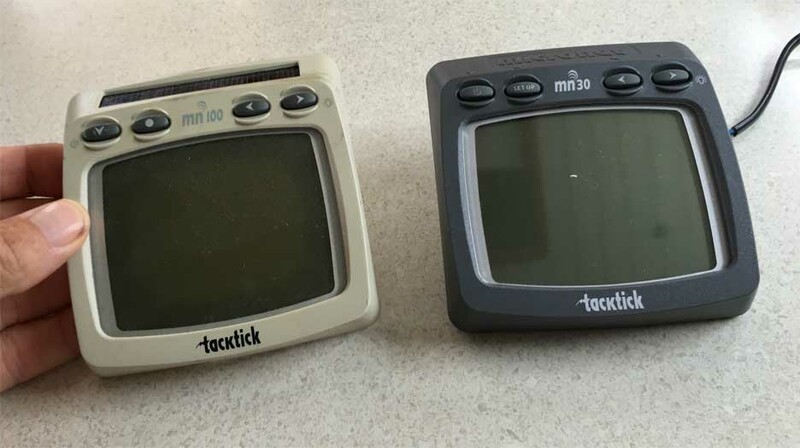 Unfortunately Raymarine has purchased Tacktick so the new wireless products are Raymarine. I don’t know if they have changed anything with the units and definitely don’t want to change the transducer. I discover the Raymarine Store in Europe that sells the system with what appears to be a slightly different model and at a very reasonable price. I contact the store and inquire about shipping to Fiji. At first they quoted me approximately 24 Euros; which is acceptable to me so I ask how to proceed. Next they inform me they are not setup to ship outside of the EU and can’t fulfill my request. What ever happened to the global economy? Damn! Fortunately we have some well traveled friends so we begin asking them for help. Our nephew was at a trade show in England then so we email him. By the time we make the back and forth he is already on his way back to the US. I ask my shore support team and they come through. Dirk and Silvie’s from Germany and still have relatives there (half of me is from Germany too but I have no more relatives there). They volunteer Silvie’s mother to be a package drop and she will then send the package on to us in Fiji via DHL. Bingo. cruise but W/ is anxious about the depth. She loves the data! A few days later I check the tracking number and miraculously the item is already in Fiji . Yeah! We we will have it soon! …. Not! It hits the shores of Fiji on July 23 and we expect it any day now. The Tacktick system was sent to the Musket Cove Yacht club which is all of 10 nm from Nadi and a short car / ferry ride. So we wait. And wait. After a week’s wait we begin checking at the office most every day for the package. We begin to worry…. just a bit. Anther week goes by. Still no package. We are planning on hitting the big city of Denarau in the middle of August and figure we may well need to head to the Post at the Airport where the Tacktick is rumored to be. But luck was with us. On Aug 3rd Bale (the prima facia yacht club personelle) approaches us and indicates our package is ready to be sent over on the Mololo ferry. We pay $5 F for customs and expect to have our coveted new / refurbished Tacktick the next day. Bingo. Almost a month after it was ordered we find it at the Yacht Club office and pay another $5 F for what I don’t really know, and I don’t really care. We have it. To celebrate I stop at the small cafe here and order another chocolate milkshake. W/ decides we need to have lunch 🙂 , so we did. Back on the boat I open it up. Good news and bad news. Obviously I didn’t look close enough, this one while having the same wireless capabilities does not have the solar charger and needs to be wired in. Ok, so I need to run some temporary wires giving us the depth display where we need it. I can do that. I read the instructions (yes I really did) looking for any other “gotchas”. Finding none I begin the task of setting it up. As this is a new display on our older transmitter I need to “sync” them together. I follow the instructions and they don’t sync. I follow them again and they still don’t sync. I try our older not working mn100 display and ironically for a couple of minutes it works fine and then returns to the “reset data” screen. That tells me that the transmitter and the transducer are both working. Great! However I still could not get the new mn30 to sync to the mn100 transmitter – Horrible. Fortunately Fiji has good (I didn’t say great) internet so I contacted my FLIR – Raymarine guy in Europe for help. An automated reply said he was on his annual vacation and wouldn’t be back for (?) . Damn! In the email there is another address for help so I sent a new request off to them asking if the mn 30 which is my new refurbished unit will talk to the mn100 which is my older unit. The FLIR – Raymarine help guy said indeed they do and sent me a pdf of the exact same instructions that came in the box. OK, I read the instructions again and tried to follow them letter by letter. Finally, I figure out when they say press button (1)/(Z) that does not mean two buttons simultaneously but either button only for the requested 2 seconds. I had wondered why one of the buttons had a different symbol on it and now it made sense. Whoopie! I try syncing again. No Luck. The worst case scenerio would be that I will need to wire in the new transmitter that I received with the unit and transfer the transducer (it is the depth sounding part) to that system. The job is not horrible but if I don’t need to make those changes I would prefer not to make those changes. Each time I attempt to sync making a little change I email the FLIR – Raymarine help desk what I have tried and my changes. As we are about 12 hours difference in time I didn’t expect any answers immediately but had hoped that the following a.m. my time I would hear from them. Upon my early morning rise I hadn’t heard from them so I went about doing more research. I first checked my original email from the FLIR – Raymarine guy on how to fix my <reset data> issue. He had a good description but it was not applicable to this situation. Next I tried some more search terms on the internet. I hit upon a Raymarine web page talking about the mn30 units. More instructions, more reading and maybe I will be lucky. In one small paragraph they talk about the two different frequencies the units use a US frequency and a different frequency for the EU. What? Two different frequencies? This could well be the issue. Now how do I check. There is No information in the manual. Zero, Zip, Nada! There was a factory reset option discussed but not wanting to mess up the potential connection to the new transmitter I held off on using that option. Reading further down the page I discovered they actually had a setting change deep in the menu’s that allowed me to switch the frequency response of the display. Ah ha! I scamper to the table (my work bench) and run through the menus. Sure enough I find it and switch it to the US frequencies. Ready, Set, Go…. I attempt to sync again. After I select the network option and the display begins the count down. In the <join> part of the countdown I receive a new message… <add node>? and I say …. yes….YES. But, is it working? The process finishes and I see data. I see depth. I am connected. Yeah! YEAH! I am elated and appalled. Why the FLIR – Raymarine does not include this information in any of their paper documentation provided with the units I will not know. Luckily they had it on their website. When I asked the FLIR – Raymarine tech they talked to each other even he didn’t say there are two different frequencies US and Europe. Fortunately we are able to again expand our horizons and move out beyond the sailing triangle of Vuda, Musket, and Denarau.